The great-tailed grackle is a large and noisy bird. Adult males grow to a size of up to 17 inches (43 cm). Their tail is almost as long as their body. 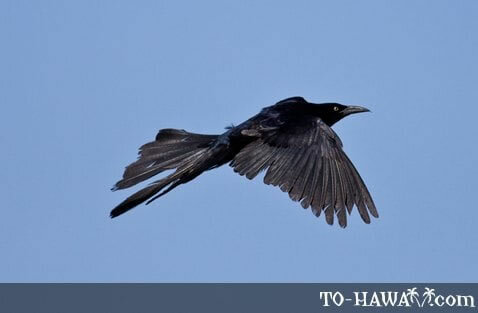 They are black in color with a violet-blue sheen to their feathers. Adult females are smaller, up to 13 inches (33 cm) long and are brownish-black in color, with a pale brown belly and throat. Their habitat is the open countryside with scattered trees and nearby water. They can be found on pastures, agricultural areas, as well as in urban and suburban areas.